The RIDGID® micro LM-100 Laser Distance Meter provides simple, quick and accurate distance readings at the push of a button. Simply push the measurement button to turn on the ultra-sharp Class II lasers, point the device at the spot to be measured, and push the measurement button. The distance reading will appear on the easy-to-read LCD display. This rugged, compact, portable instrument enables professional tradesman to quickly determine distances for piping, measuring trouble spots down the line, and quickly determine spacing for code compliance. Ultra Sharp Class II Lasers clearly highlight the point being measured. Exceptional distance range allows accurate measurements up to 328' (100 m). Adjustable units enable you to quickly read feet, inches or meters on the fly. Bright backlit display for use in poorly lit areas. Quick and accurate calculations on the spot. Displays the last three measurements, stores the last 20 measurements. Rubberized over-molding for a solid grip. Measurement Accuracy ±1/16" (1.5 mm). Range 328 ft. (100 m). Measurement Units Inches, feet and meters. Measurement Calculations Area, volume and indirect measurement calculations. Power Source 2 AAA batteries (included). Ruggedness IP 54 dust proof, splash proof. 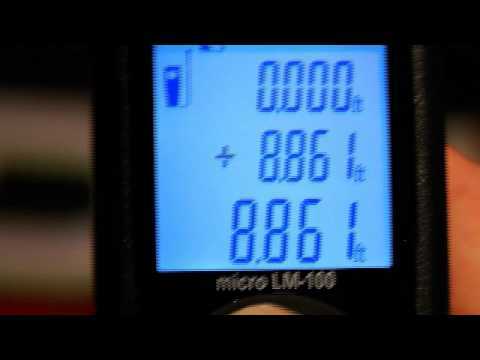 micro LM-100 Laser Distance Meter is rated 3.6 out of 5 by 8. Rated 4 out of 5 by Halimo from This product is very good i like your equipment and in future if I need some equipment first i will thinking for RIDGID. Rated 4 out of 5 by BILLTHEPLUMBER from The product was up to the usual RIDGID high standards. Right out of the box it was easy to use. Accurate in all indoor conditions that I used it in. Am a construction superintendent and used this tool for all my as built measurements, Every time I pick it up I discover a new feature. As always RIDGID has put together another rugged and useful tool. Rated 4 out of 5 by beckyj from absolutely love it! I bought this product for my husband for his birthday. He says he loves it and that it is a great product. I am not sure why the other review was not so good. He had no issues with it. Rated 5 out of 5 by Burgu03 from My husband loves your products! Works great! Easy to read!the brand is great. Would suggest to all our friends and family.